Happy Swatch Saturday! Today I have a gorgeous new collection to show you. I luckily swatched these before breaking my nails, but was saving them for today. I have some wear tests that I have done, but I'll show you later on (as in next week). But I have been extremely impressed by them. Cynthia of Alter Ego recently reformulated her polishes, which I showed HERE. I am LOVING the new formula and application. This is her first creme collection, so let's check it out. Nicole Diary Water Decals with Cirque Colors Acid Wash + Tutorial! Today is the last day of Nicole Diary water decals. I hope you've enjoyed the various looks. Today, I'm also including a visual tutorial of how to use these decals, so let's get to it! Day 4 of Nicole Diary water decals. I hope you aren't bored of them. They are super intricate designs that would take me forever to hand paint. Now, that doesn't mean I'll never hand paint them, but if you're in a rush or want a guaranteed 5-7 days of manicure, these decals are awesome. Day three of water decal week! This time, I'm doing a neon gradient with a tropical t-shirt pattern. It's perfect vacation nails! Hello All! This season is THE season for soccer fans between the UEFA and the Copa Americana. My longtime boyfriend happens to be Croatian, so of course, I support Croatia along with him! I decided to do my nails to match their flag and the jersey. Croatia has a very complicated crest on their flag, so this is my simplified version! It's day two of water decal week and this time I'm showing you an abstract funky design with coordinating skittle mani. I received 5 full nail water decals from Nicole diary and instead of bombarding you all with a million pictures, I've decided to turn this week into water decal week! I wore every decal for a few days as a wear test review also! I had an event to go to and wore a pretty dress, so of course I had to coordinate with my outfit. Two polishes from the latest Paint Box Polish Ciao, Gelato collection matched perfectly, so let's take a look! Today I have the Pixie Dust part of the summer 2016 collection from Zoya. I LOVE textures and I've been neglecting them lately. I am so glad that Zoya returned to its original pixie dust formula. All of these are awesome for summer and I have done a few comparisons as well! 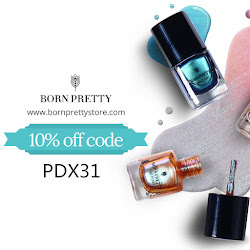 Born Pretty is a great place for all things nails art! I've been reviewing and purchasing from them for years. 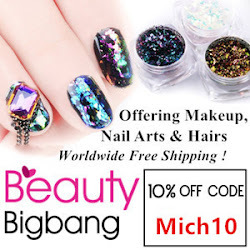 Although shipping takes a while, it's a great resource for nail art. So I decided to try out some nail stencils, and well, let's see how I did. Today is my 4th year of blogging and the anniversary of when I started blogging! I began blogging with my birthday mani from the week before and well, I've kind of kept that tradition. My birthday was this past Monday and I wanted NEON! I feel like I always want neon! Grab your coffee or a drink and sit down for a huge post. You've probably seen the Zoya Sunset collection for Summer 2016, but today I have a huge post with a ton of comparisons. With so many polishes, sometimes when we see a new Zoya collection, we go hmmm.....have I seen that color before? Well let's see how these new "one coat" cremes pan out. I showed you three Alter Ego polishes earlier today and now I want to share two body care products with you, so let's check them out! Hello there! I took two days off to celebrate my birthday and it was a lovely and relaxing day. Today, I'm showing you three polishes from Alter Ego! She has recently reformulated her nail polishes, and I have one comparison for you. Let's check it out. It was grey here for weeks and so I was feeling like grey polish. So here was my NOTD. I'm back with my last of the new Sinful Colors releases. This is the Pure Satin Matte collection. Unlike yesterday, this dry much more matte than the demi mattes. The Pure Satin Mattes comprise of 16 colors and I'll be showing you 7 today with a wide range of finishes. Good morning! Today I'm showing a delicate and simple manicure, that with the addition of stickers, really elevates the manicure. Let's get to the details. I showed you art with 6 polishes from the demi-matte collection and today, I'm showing off these colors on their own. The demi-matte collection has a total of 13 polishes, so this is about half of the collection. Not one disappointed me, so let's take a look at the colors! Note to self: don't go out with no nail polish on! I never fail to break a nail, so here's my shorties! Good evening! I know, I know. I've been absent. I'm back and in full force. I have tons of collections to show you, some stamping, some simple art. I recently had the chance to try out 13 new colors from Sinful Colors. There's a giant release of new colors in connection with Kylie Jenner, and I have 2 of the 3 collections to show you. I decided to do a WEAR test on Kashmere, so let's check out the results!